RevWood Plus from Mohawk Hardwood Flooring combines classic oak sophistication with waterproof laminate technology for authentic hardwood beauty that’s worry free. This revolutionary flooring provides all the beauty and texture of hardwood in a product that stands up to scratches, scuffs, stains and dents, even in active households. It provides oak visuals in trending colors with distinctive knots and grain patterns are highlighted with embossed in register texture and chisel-distressed edges for ultra-realistic detail. RevWood Plus uses a combination of proprietary features to create waterproof protection. The Uniclic© joint system, GenuEdge© pressed bevel edge and Hydroseal perimeter coating in combination creates the RevWood Plus waterproof technology. Although the individual planks are not waterproof, RevWood Plus is waterproof when installed correctly giving you floors that you can wet-mop. Your RevWood Plus floors are protected from day-to-day spills, all pet accidents, and pet scratches. RevWood Plus protects against pet accidents and is covered by our All Pet™ Limited Lifetime Full Pet Stain Warranty. You’ll have complete peace of mind with the all Pet Plus warranty and a limited lifetime moisture warranty. All of Mohawk floors are subjected to rigorous tests that are designed to ensure that all Mohawk products meet the highest standards and do not harm interior air quality. 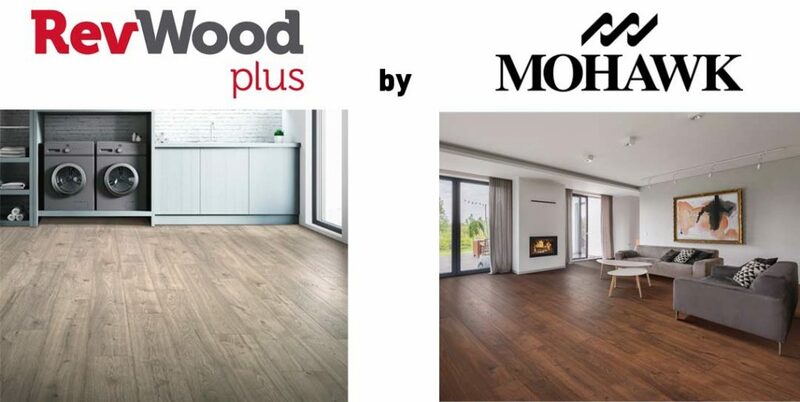 RevWood Plus is no exception as a FloorScore Certified product with a low VOC footprint. This floor is safe to put in any room of your home including your basement. RevWood Plus is proudly made in the USA. Don’t forget to register to win a gift certificate good for $500 off your purchase of $1,000 or more in Mohawk Hardwood flooring this great offer is from Vermillion Hardwood Flooring & Granite – the 2018 HBA Home Remodeling Show Prize Sponsor. Make sure you stop by booth D108 and see Vermillion’s displays of hardwood flooring. This post brought to you by Vermillion Hardwood Flooring & Granite.